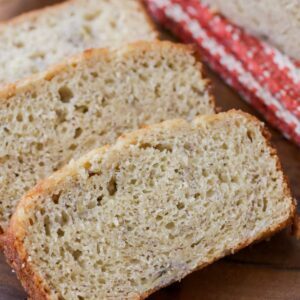 The BEST and Easiest homemade Banana bread recipe that is moist, simple, and so easy. 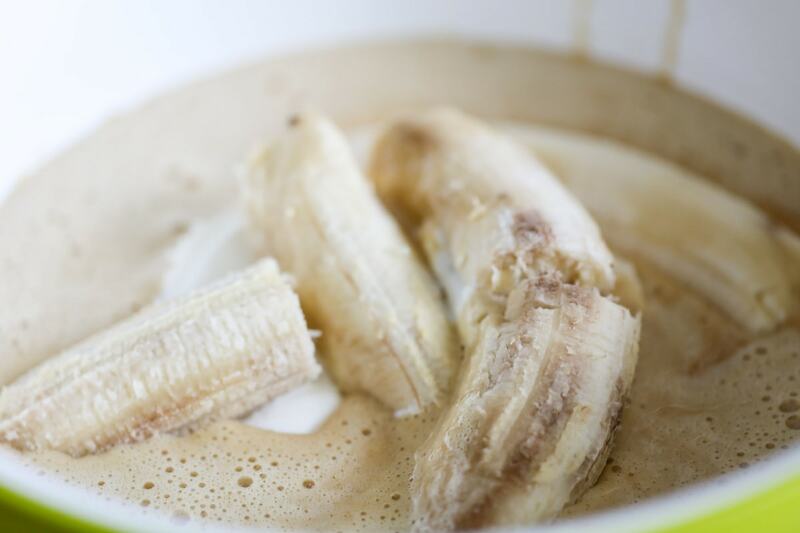 Everyone loves this no-yeast recipe that is easy and perfect to make with over-ripe bananas. 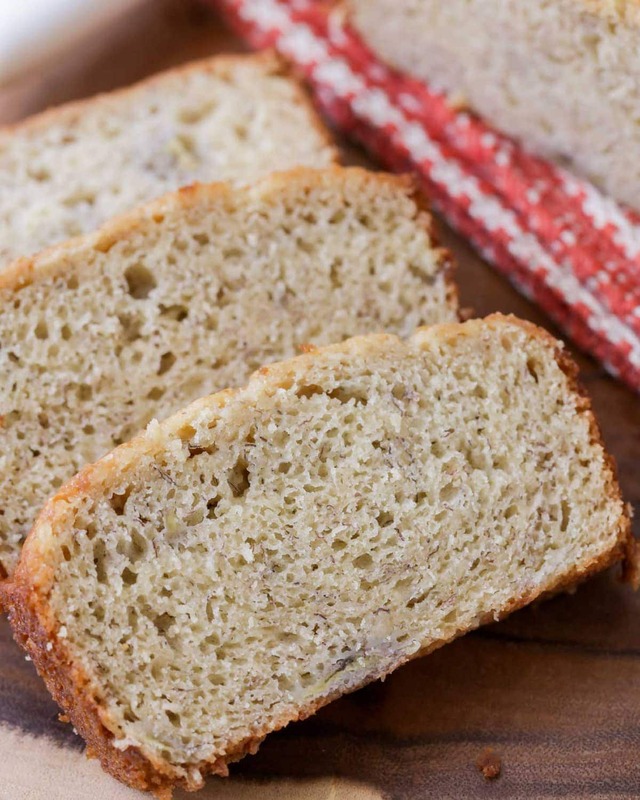 Banana bread is one of those bread recipes we’ve enjoyed our entire lives. My mom has tried so many different versions over the years, but today’s easy banana bread recipe is, by far, our favorite. 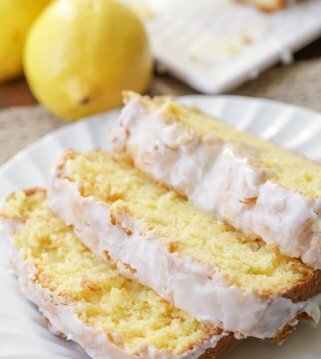 It’s so simple, moist and delicious. 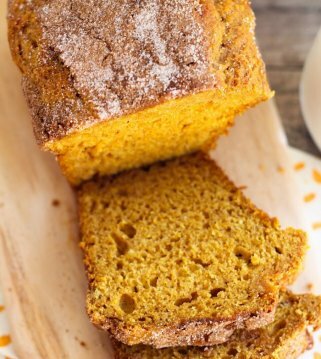 We love that this quick bread is made in just about 5-10 minutes and then popped into the oven. When we first made it, it was gone in about .2 seconds and I asked my mom what the secret ingredient is. She replied, “it’s actually sour cream and whipped topping mix.” I thought she would say love, but apparently the whipped topping and sour cream make it super moist and super tasty. We now use this recipe any time we have over-ripe bananas sitting on the counter, which happens more than I care to admit. Once you have the ingredients and you’re set, you’ll just follow these easy steps… begin by preheating your oven and grease two large loaf pans. Cream sugars, oil and eggs. Add vanilla, sour cream and bananas and blend well. Mix dry ingredients in another bowl and add to wet ingredients (if you add nuts or chocolate chips – this is the time to do it). Blend and pour into greased pans (this is also where you can add the cinnamon/sugar topping). Bake for 40-45 minutes and you’re set! Line your bread pan with parchment paper. Leave a couple inches to fold over the top of the pan. Once the bread has been cooked use the parchment paper to easily lift the bread out of the pan. Cool and serve. Use an electric mixer to smash your bananas. Break each ripened banana into a few large pieces. Begin mixing at low speed gradually increasing the speed as the bananas begin to mash. What is whipped topping mix? One of the questions I get often, is what is whipped topping mix? This is what it looks like. You can usually find it on the top shelf of the baking section. If you can’t find it, you can also make your own: In a separate bowl mix ¼ c powdered milk, ¼ tsp vanilla powder, 1 tablespoon sugar. 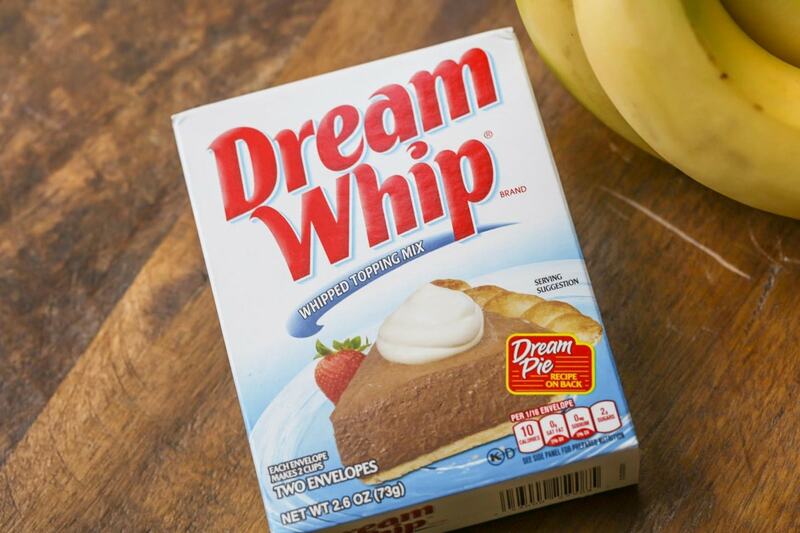 4 Tablespoons mix=1 Dream Whip packet. Store left over mix in an airtight container to use later. What if my bananas aren’t ripe enough? There are a few ways to be sure you’re bananas are ripe enough when you are ready to make banana bread. Oven: Place the UNpeeled bananas on a foil lined baking sheet. Bake at 350 degrees F for 15-20 minutes or until the peels have turned black. Once they have cooled slice open the peels and scoop out the ripened center. Brown Paper Bag: If you can wait a day or two, then use the brown bag method. (this also works to ripen other fruits such as peaches and pears) Place the bananas in a brown paper bag and fold over the top. Ethylene will build up and circulate within the bag which speeds up the ripening process. Keep a stash in the freezer: Place the UNpeeled bananas in a freezer safe ziploc bag. Remove any excess air. Freeze for up to 3 months. When you’re ready to use thaw the bananas and remove the peel. Do you have to use over-ripe bananas for this recipe? Overripe bananas work best because they’re easier to mash and are sweeter. How long do I bake banana bread in different pans? Mini Muffins bake at 350 degrees F for 10-15 minutes. Note: insert a toothpick to test for doneness. If it comes out clean remove pan from the oven. If it does not, then cook longer, checking at 5 minute intervals, until done. Remove bread from the pan as soon as it is done baking and allow the bread to completely cool before storing. Countertop: Place in an airtight container and store for 2-3 days at room temperature. Freezer: Wrap the bread with plastic wrap then store in an airtight container or wrap again with aluminum foil. Label the contents. Freeze for 3-4 months. This recipe definitely makes a moist banana bread that everyone goes bonkers for. We know that the sour cream and the whipped topping mix help with that, along with the over-ripe bananas. But bottom line, all we know is that this is our favorite banana bread recipe. Fresh out of the oven, a warm slice of banana bread really can’t get any better (unless you maybe added the chocolate chips or cinnamon/sugar mix on top OR you tried our Cream Cheese-Filled Banana Bread Recipe). We hope you love this recipe as much as we did. If you have any questions or suggestions, let us know. 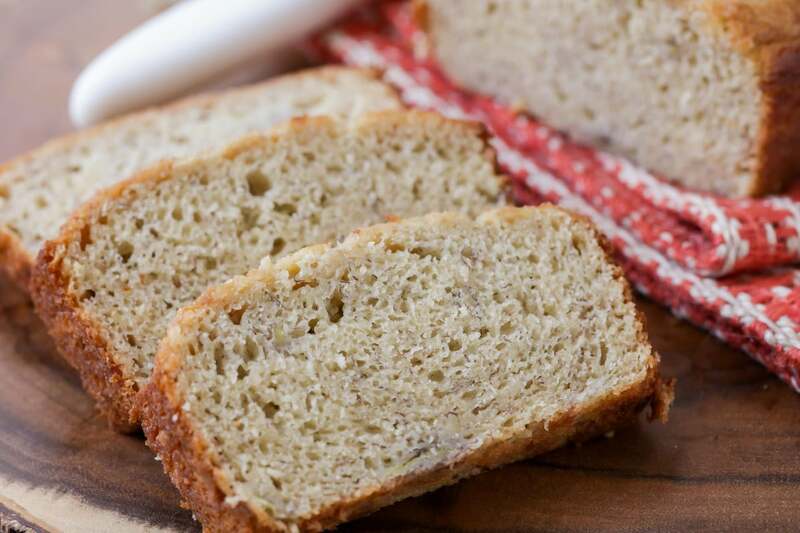 We’d love to add to our tips list for making this easy banana bread recipe. Ok so what is the recipe? It looks soooooo yummy! I use a banana bread recipe that includes a stick of butter & a brick of cream cheese (for two loaves)… super tasty, not super good for you! I bring it up another notch by adding a streusel topping – two parts flour to one part butter & one part brown sugar mixed together until it’s crumbly. For two loaves I use 4T flour, 2T butter & brown sugar. YUM! I would love to try your recipe!!!! Yum! It’s been so long since I made banana bread, my boys always eat all our bananas while they’re still a little green. I’ll have to hide some bananas to make this. You’re newest follower from http://www.theblondekitchen.com. Come visits sometime! Wow! The title of the recipe couldn’t be more fitting! As an addition, try 3 TBSP’s of cinnamon. what is an “envelope of whipped topping”? I cannot find a store around me that carries it. I found it in the baking aisle with the pudding and tapioca mixes. Lived in up-state NY,Know in Florida an i have never heard of it. I have eaten this one. This is really best banana bread. Perhaps, this banana bread tastes good. Well. I can find it after making this recipe. Wow! What an awesome recipe, will definitely try this one and I pinned it as well. Thanks so much. what is an envelope of whipped topping? You can find it over in the jello aisle. It comes with 4 packets usually in a box. The envelopes of dry whipped topping are Dream Whip. The recipe calls for 1 carton of sour cream. I can only find 8 or 12 oz (or bigger) cartons and am wondering if there was maybe a typo in the recipe. Let me know! Don’t want to weigh it down too much! Is there anything that can be used as a substitute for the dream whip? I can’t find it at my grocery store. I just made this and it was awesome! 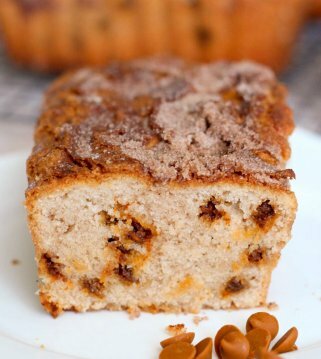 Super moist and delicious and would be good with walnuts! Can I leave out the whipped topping out or what can I replace it with? We are overseas therefore not available at the stores here, thanks. Hello, I’m gona make this banana bread recipe. Can you tell me please, did you use 2 regular size loaf pans? I’m guessing it makes two full size loaves. Thx U! We LOVE banana bread in our house! It rarely lasts more than a couple of days. I have a favorite, but the recipe is lost in our storage unit at the moment. I’ve been making the one I linked below with less banana and sometimes adding some unsweetened applesauce when I’m short a couple of bananas. 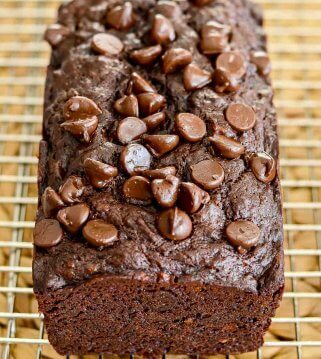 Here is my favorite banana bread. have you tried to use apple sauce instead of the oil? I usually do this in my banana bread recipes to make it a little healthier and it works great. I wonder how it would work for this recipe. The whipped topping is called Dream Whip. Hi everyone, I’ve tried this recipe last week, all my friends and I thought it was amazing. In france we don’t have the whipped topping so i checked the ingredients on the Internet and i found out that there was mostly crisco and milk powder in it. so i replaced these ingredients with a little bit more sour cream and 2 tbsp crisco… it did the job. however i don’t know what cake mould size you used, but for the one i used, i could make 2 cakes with the quantity you gave us. I’ve also tried it in a cup cake size, and i think it was even better. thank you for sharing your recipe. Hi, one year ago in January of 2013, I asked what size loaf pans you used in your banana bread recipe. Please, what size loaf pan(s) did you use and thank u! Nice bread recipes. Thank you. Your bread loafs look beautiful, tasty, appetizing, irresistible, and the list go’s on and on. I will be trying many of your recipes. Just hope they look like your. Awesome!!!! Let me know how they go if you give them a try. We LOVE homemade bread at our home! I want to make this now! Love this blog. 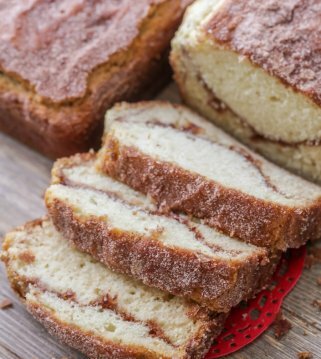 I have made the cinnamon bread already and my family loved it! I will bake this banana bread today. Do you think greek yogurt can be used in place of sour cream? I know that the sour cream is the secret ingredient but I only have yogurt. Try using coconut oil. It’s the best oil for baking/cooking and the healthiest! I also use Greek yogurt instead of sour cream!!! Delicioso!! I love this recipe. Thanks for share this. I will be doing a video on my channel whith this bread! It’s ok? I prefer that you do not use my recipes in videos. Thank you! I love the gift tag you created for your banana bread! So cute. I feel the same way about seeing the ripened bananas on the counter….yay for banana bread!! It’s a win/win! I love a good banana bread recipe! I will have to give your recipe a try! Looks delish! Pinning for later! You’ll love it (hopefully :)) Let me know what you think!